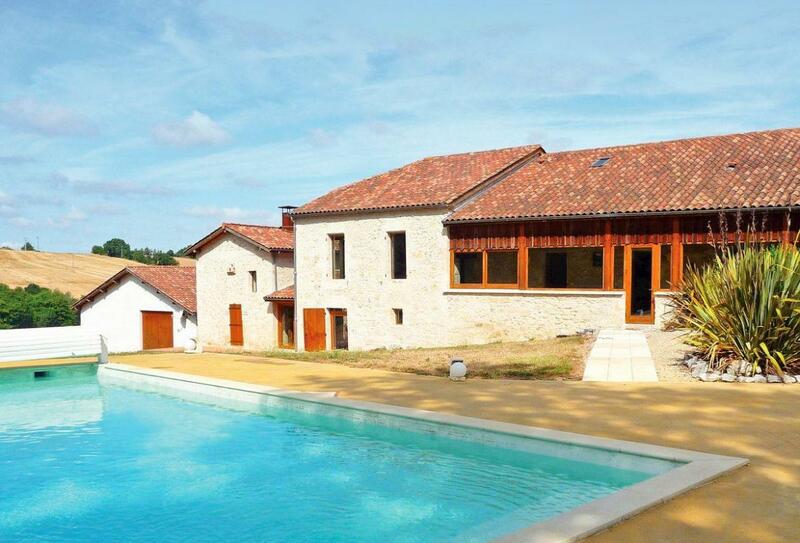 Brilliant 6 bedroom holiday home sleeping 12 near Villeneuve-sur-Lot, Dordogne and Lot. A splendid holiday villa for an unforgettable family holiday, this property offers a private pool and has everything you"re looking for in a holiday home! On site parking. Satellite TV. Cot available. Highchair available. Airport within 1 hour. Pet friendly. Renovated stone character holiday property dating from 1783 in the heart of the Lot-et-Garonne countryside. Carefully restored, it offers large living spaces with lots of charm, and its central fireplace makes it a warm and comfortable room. The property offers a private outdoor swimming pool, and a large terrace with a barbecue and views over the beautiful valley, perfect for enjoying al fresco meals. There are five large double bedrooms, three with en-suite bathrooms and toilets. While the single bed on the first floor can accommodate an extra child. There is table tennis and board games available. Shop and restaurant 5km. Ground floor: Lounge/kitchen/diner, separate toilet and basin. First floor: 3 double bedrooms, 2 with en-suite bathrooms, toilet and basin, 1 with en-suite shower room, toilet and basin, mezzanine with single bed (for child). Second floor: Bathroom with separate shower and basin (no toilet), separate toilet, 2 double bedrooms, 1 with additional single. Open fire in lounge, gas heating, 2 cots, 2 highchairs, 2 satellite TVs, DVD player, CD player, wi-fi, washing machine, dishwasher, microwave, lawned garden, terrace, garden furniture, barbecue, outdoor swimming pool (private, 66m², open Jun-Sep weather permitting), ample parking. One pet welcome. NB: 4 steps to entrance. Turning stairs to first and second floors. Sloping ceiling on second floor. Slopes and uneven surface in grounds. Sorry, no hen or stag parties.